The second book in the series is also a fun, fast paced read that's hard to put down. 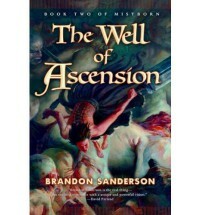 Sanderson expands the universe a bit to make things even more epic, there are plenty of twists and turns, and at the end, you're left with no choice but to pick up the third book. This isn't a deep, philosophical novel, but there are parts that will make you think, and in between those parts, is a solid action/fantasy story that will make you smile.